In the early chapters of his first epistle, the Apostle Peter challenged Christians to personal holiness (1:15). By that he means we are to be different from the world around us in the way we live our lives. While committed Christians strive daily to meet that standard, we know that living distinctly holy lives today will almost certainly result in ridicule, rejection and/or persecution in our post-modern world. Peter understood this, and he knew that his readers would have serious concerns about how to deal with the world’s response to their counter-cultural lifestyle. He addressed their fears and ours in the third chapter of First Peter. His words of “Hope for Suffering Christians” are as true today and they were when first written. Early in this passage, Peter assures believers by reminding them that we each and all are Protected by God. As we saw before, there is nothing that the world can do to jeopardize our ultimate status with God. Today, we examine the second of Peter’s eight timeless truths, which he communicated to Christians in Asia Minor and by extension to all Christians who are enduring suffering and persecution. Throughout Scripture, God promises that our eternal destiny is secure if we have placed our faith and trust in Jesus Christ as our Lord and Savior. But, He never promises us that the road will be smooth or easy. On the contrary, righteous living sometimes brings persecution and suffering. Peter warned Christians of Asia Minor not to be surprised when heavy persecution came (4:12), and he instructed them to entrust their souls to a faithful creator (4:19). Here in 3:14 and again in 4:14, Peter assures believers that they are blessed, even if they are reviled and suffer. No one can take away our blessing, that is promised by our omnipotent, omniscient and omnipresent God. The ultimate proof of our faith is the eternal salvation of our souls as Peter said previously (1:7-9). And, as our Lord himself said in His sermon on the mount, “Blessed are those who have been persecuted for the sake of righteousness, for theirs is the kingdom of heaven” (Matt. 5:10). So again, when trials and suffering come, and they will, let us not fear any man but hold fast to the hope we have in Christ Jesus and remember that we are protected by God and we are permanently blessed by God. 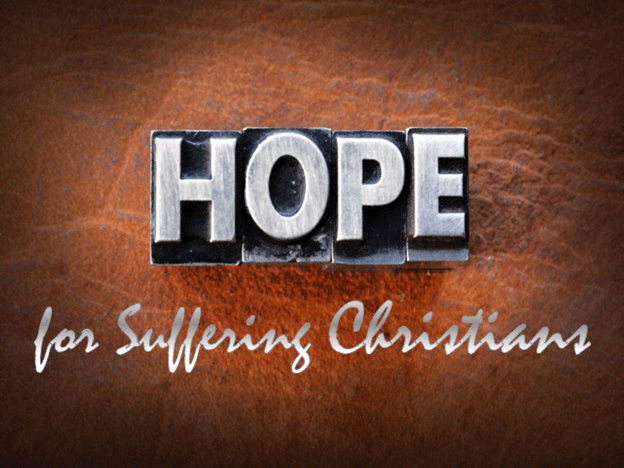 Hope for Suffering Christians is an eight-part series of posts that examine eight timeless truths that Peter communicated to Christians in Asia Minor who were enduring suffering and persecution. These truths are a relevant today as ever. Follow the link above to read more about all eight principles.